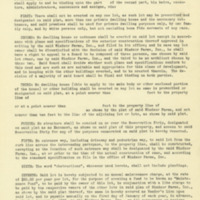 Home Owners' Loan Corporation (HOLC) Map of Richmond, 1937. 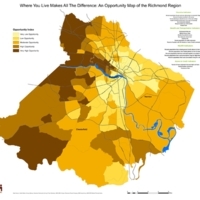 Where You Live Makes All the Difference: An Opportunity Map of the Richmond Region, 2013. 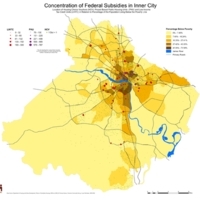 Concentration of Federal Subsidies in Inner City, 2013. White Flight in the Richmond Region, 1960-2010. 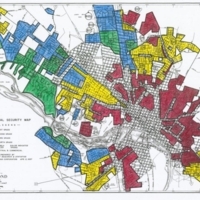 Current Poverty Areas Compared to 1937 HOLC Map of Red Lined Neighborhoods, 2010. 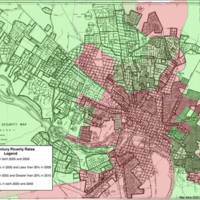 This overlay shows 2010 poverty data on the old 1937 HOLC map that red lined black neighborhoods. 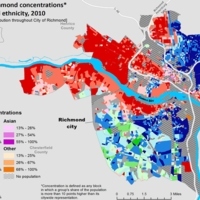 Concentration of Poverty in the City of Richmond, 2010-12. 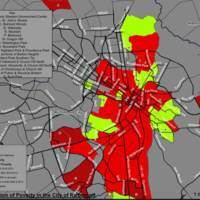 This enlargement shows the gentrification occurring in once high poverty areas of the city and the emergence of high poverty areas in the suburbs. 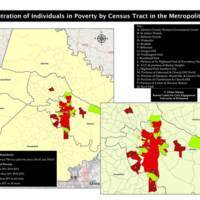 Concentration of Poverty by Census Tract in Metropolitan Area, 2010-12. 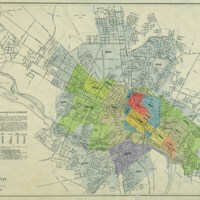 Map Showing Territorial Growth of Richmond, Department of Public Works, 1923.